A weakening housing market needs lower interest rates to improve, at least in the short, or perhaps medium, term. Inflation is too low and there are good signs it will go lower, not creating a problem for the Fed to slash rates. Nonetheless the Fed will be unlikely to cut its policy rate, as desired by president Trump. According to Larry Kudlow, head of Mr Trump's National Economic Council, the president wants a rate cut of 0.50%. I somewhat agree that a rate cut would help the economy at this moment, but I will also add some very important details later on. Last year I had expected inflation, and therefore treasury yields, to fall. Almost everybody on Wall Street was expecting the opposite, and they were betting against US treasuries, crashing longer dated treasuries for a few months. In June, I wrote that longer dated US treasuries, which were arguably the most "frowned upon" major investment class "may prove the best investment, again." They did prove to be an excellent investment, and arguably the best among the major investment classes (stocks, real estate, corporate bonds or Emerging Markets) by the end of last year. Although risk assets have done very well this year so far, I am still pessimistic about the remainder of the year. Nonetheless US treasuries have still done very well compared with June last year, as they have offered 2.90% in yield and also investment appreciation due to the fact that inflation has moderated (therefore longer dated treasury bond have become dearer as yields have fallen). This is what I argued for in the June article. Inflation is proving elusive, and despite what almost everybody expected until around the fourth quarter of last year, inflation has been unable to overshoot the Fed's 2% target. 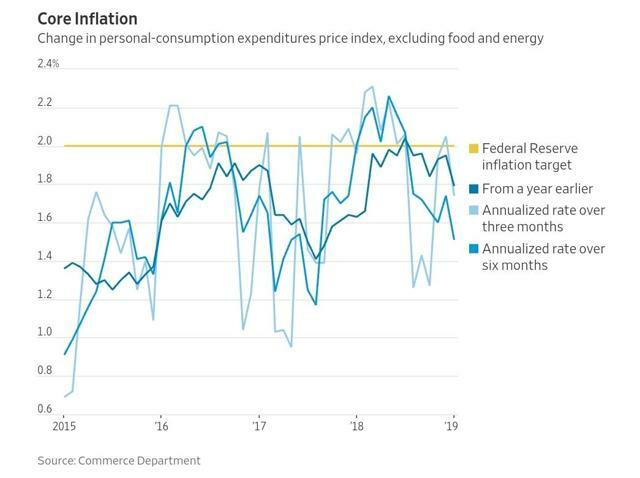 As it can be seen in the chart below, the Fed's preferred inflation gauge, Core Inflation (NYSEARCA:CPI), has only occasionally touched 2% in recent years. The economy has also continued to soften, not just in the rest of the world, but also in the US, which had for quite a while defied the global slowdown that started early last year. This in itself may not present a compelling argument for the Fed to cut rates, but the more worrisome issue is rather the stubborn lack of inflation. Or at least this is how I see things - those at the Fed may not concur yet. Mr Trump is also worried about the prospects of the economy, and he is blaming the Fed for the current slowdown, as he had also warned prior to the last rate hike in December. The real worry is in fact the housing market and what inflation, or the lack of it, is saying about it. For the first time since 2012 rents dropped on a yearly basis in late 2018. Many might view this only as a positive for consumers, and perhaps even the economy as a whole, but things are more complicated than that. Modern economic theory is shaped and founded - mostly by accident I guess - on asset prices rather than productivity. Falling assets prices are simply bad, no matter how inflated they are. This may be bad for the society (causing too much income gap and so on), but that is how things work now according to modern economic theory. Last time the most important asset class - housing - had a sharp fall in value, the world economy suffered its worst contraction since the Great Depression. Central bankers (spearheaded by the Fed) have, for decades, orchestrated almost miraculously quick economic recoveries through their 'tested' ability (they might not pass the next test though) to pump asset prices after every economic downturn. And they have been able to do this by cutting their policy rates sharply at every economic slowdown. This is the reason why the fall in US rents that started last year is not exactly a good sign. First I wrote about rents falling was back in February 2018, and I referred to it as a good indicator for trouble ahead. Back then it was only about some of the largest metropolitan areas like New York, San Francisco etc. Now it is a nationwide reality. This is not a good sign for house prices in the near future. After all, the most important factor for real estate valuation is the yield. A falling yield will, eventually, lead to a fall in the value of the underlying asset. Housing prices have moderated nationwide, but they haven't started to fall yet. Furthermore sales have been falling since the middle of last year, and this combined with the fact that house prices have already started to get deep cuts in some of the most important markets (Manhattan, San Francisco, Miami etc), does not bode well for the future of the housing market in the coming quarters. Rents also first started falling in the most sophisticated markets, and then across the country. The continuation of this trend (softening housing market) in the coming quarters will be quite a challenge for the 2% target rate of the Fed. Housing is more than 40% of CPI. A deflationary housing environment all but ruins overall inflation. It is true that a fall in mortgage rates over the past couple of months has meant a positive for the housing market, it is still far from certain that it will be able to stop the slowdown in the housing market. 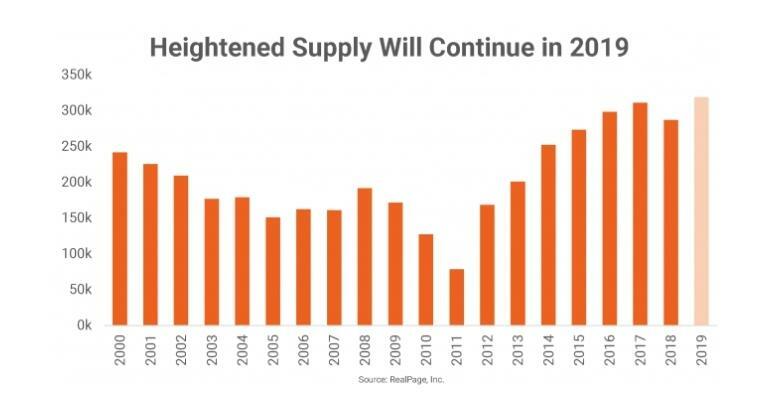 There is no sign yet of any pause in the multifamily supply (chart below), as near record numbers of newly built apartments are expected to hit the market. Additional supply, combined with an already weaker economy, seems like the best recipe for more pressure on rents and housing prices. This looks to me like a pretty bad outlook for the housing market, and a bad housing market - as evidenced by the severity of the last recession - means real trouble for the economy. Should the Fed cut its policy rate then, in order to save the housing market, and hence the economy? An immediate cut to the Fed funds rate could indeed come in very handy, or at least for the coming few quarters, as it would also offer a meaningful boost to the economy. I am not so sure about the durability of the effects of such a measure though. Fed policy makers on the other hand have a much greater concern at hand. That's why they will not cut rates, as Mr Trump wishes. What concerns the Fed most is the reality that can be seen in the chart below. The Fed had to cut rates by at least 500 basis points (5%) in order to relaunch economic growth after some very benign economic downturns, like the ones in early 2000s or in early 1990s. The severity of the downturn after the 2008 crash meant that a 5% cut was insufficient, so QE was invented (as a popular phrase for digitally printing new money) to offer some additional stimulus to the economy. Nobody knows exactly how efficient QE was, but looking at how long it took for the economy to recover this time, it was obviously not that good. As the current Fed funds rate is just above 2% (very far from 5%), it is anybody's guess what will happen when recession hits again. This is also a serious concern for Fed officials. They are legitimately wary of the potency of the remaining interest rate ammunition they have at their disposal. And I believe they will prefer to hold off until things start to get ugly, which they are not now. The stock market has recovered quite a lot since late last year and there are no other serious and immediate economic hazards out there. The tricky thing is that in the absence of a rate cut (now), the housing market will continue to deteriorate, and the more it deteriorates the deeper a rate cut will be needed to stabilize it. At some point the Fed will start cutting rates, and it will either happen because of a scary crash in the stock market, or a significant worsening of the economy, or both. But I doubt the Fed will take a more proactive role, as usually desired by presidents, to stave off a possible slowdown in the near future. The last time the Fed acted because of presidential pressure was in 1971 when then Fed chairman, Arthur Burns, reversed course on rate hikes, as Mr Nixon had desired. It is true that, unlike early 1970s, inflationary pressures are very far from threatening at this moment. And I do not see many other similarities between 1971 and 2019. However I doubt those academic minds at the Fed will see the inflationary mess that took over the 1970s as nothing but another reason not to bend to the current president's profligate leanings. Many market participants will probably be very disappointed to find out about this in the near future - that the Fed will not be as accommodative as they had hoped.